six weeks of rigorous space environment simulation, another part of the RBSP team is busy ensuring that the spacecraft will successfully perform their science gathering mission after launch in August 2012. 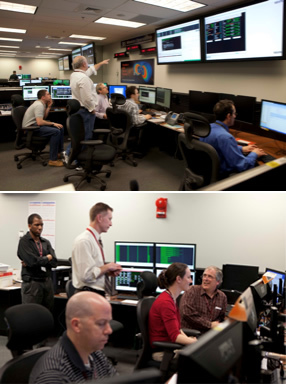 On March 13, the RBSP team at the Johns Hopkins University Applied Physics Laboratory (APL) in Laurel, Md., began a 10-day-long mission simulation designed to end March 22, 2012. It is the third such simulation to date, but the first full systems test, and it will put the instruments and RBSP control systems through every phase of operation during the period designated as February 13-23, 2013. “This test puts both spacecraft, as a system, through the paces they will go through during the mission,” says Ray Harvey, RBSP mission operations manager, and lead ground segment system engineer. “It’s a 24-hour-a-day simulation of both spacecraft in their routine science operations phase, about six months after launch,” Harvey explains. “We’re operating both spacecraft from the newest mission operations center [MOC] here at APL, using the same hardware and software, and same processes and procedures, that we’ll use after the actual launch.” Operating the instruments while they are in thermal vacuum testing is a key verification of the systems’ capabilities (an RBSP team stationed by the thermal vacuum chambers monitors the spacecraft at all times, including during the simulation). The science instrument teams – located at the University of New Hampshire, University of Iowa, University of Minnesota, New Jersey Institute of Technology and the National Reconnaissance Office in Virginia – will be sending commands to the MOC at APL. When the simulation calculates the spacecraft are in contact with a satellite station (located across the globe, including APL’s 60-foot dish antenna), the MOC sends those commands to RBSP. The instruments then send simulated data back to the MOC during later contacts, and the APL team makes the data available to the science instrument teams for their continued processing. “We have two people working each spacecraft during every contact,” Harvey says. “We need to get 5.9 gigabytes (GB) of data down from each spacecraft each day” – during an RBSP-to-Earth contact period of about 3.5 hours – “but we’re trying to get 6.3 GB for additional housekeeping data and to account for possible ground station outages.” For comparison, most common DVDs hold about 4.7 GB. A design concept known as “decoupling” helps both the mission operations team and the science instrument teams do their jobs at the same time without interfering with one another. The science instrument systems are designed to run independently (decoupled) from basic spacecraft systems such as communications and propulsion. 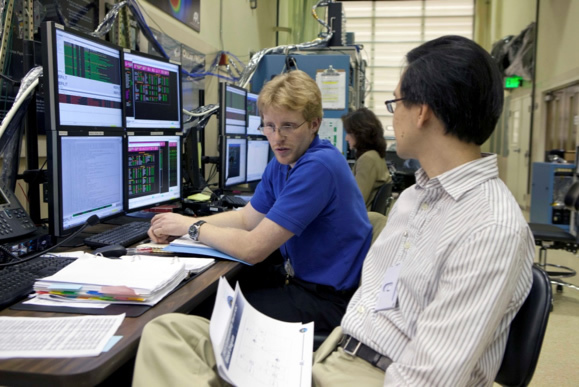 The science instrument teams can run all of their simulation tests on their own without worries of conflicting needs for spacecraft resources with the mission simulation team. While the RBSP 10-day mission simulation is being run from APL's mission operations center (MOC), engineers located near the thermal vacuum testing chambers monitor data and the twin spacecraft themselves, making sure that the testing is proceeding as designed and that RBSP is safe and secure. RBSP is scheduled for launch no earlier than Aug. 15, 2012, from Cape Canaveral Air Force Station, Fla. APL built the RBSP spacecraft for NASA and manages the mission. The RBSP mission is part of NASA's Living With a Star program, guided by the Heliophysics Division of the NASA Headquarters Science Mission Directorate in Washington.